When you visit your local bakery, you will probably have some options. You can buy the cupcakes you want from the selection that is there available for you, or you can order them. When you order them, you may want to order your favourite frosting to have them topped with. There are some great choices that you may not be aware of. Also, you may want to decide between a frosting or an icing, as there is a slight difference between the two. 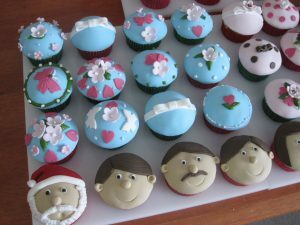 Frosting is much stiffer than icing and more can be done with it in regards to decoration. It usually has some type of butter in it. Icing, on the other hand, is thin but has a lot of sugar added to it. Normally, if you don’t specify which type of frosting you want, you will end up with cupcakes that have been topped with a buttercream frosting. There is certainly nothing wrong with this as it’s yummy and happens to be a favourite of most. If you want something extra special then you could choose one of the buttercream variations. Swiss Meringue buttercream is one of them. This is a mix of swiss meringue to which cubes of butter are added to in order to make the frosting. Another version for this is made using Italian meringue. If you are going to use this then make sure you refrigerate the cupcakes until they are ready to be served. It is a much lighter frosting when it comes to sweetness, but can be more difficult to make because you need to get the whipped cream to the right consistency. These are just a few of the many different types of frosting that you may want to consider for your next batch of cupcakes. Then again, don’t totally ignore the icing because it has some great options too.